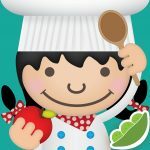 Exploring a wide variety of foods through sight, sound, and touch on a mobile device doesn’t seem possible, but the ABC Food app combines attractive photos, interesting and diverse videos, and interactive games to create an almost sensory-based food experience for a wide age range of children. This award-winning app teaches children new words through sight, sound and touch. Let them chop celery, cook pasta, slice strawberries and more through beautiful pictures, lively videos, and interactive scenes.